Hertz knows things can go wrong on the road, so we offer our Basic Emergency Roadside Assistance with each rental - which covers the mechanical defects of the vehicle only. Our Hertz Premium Emergency Roadside Assistance is an optional service which, if accepted, reduces your financial liability for services required to remedy non-mechanical problems of the vehicle and/or problems resulting from an accident or collision. To add Premium Emergency Roadside Assistance to your rental, ask your Hertz counter representative to add the service to your reservation. To book your next rental car, click on the button below. *90 minutes begin after Emergency Roadside Service Representative received receives the phone call. 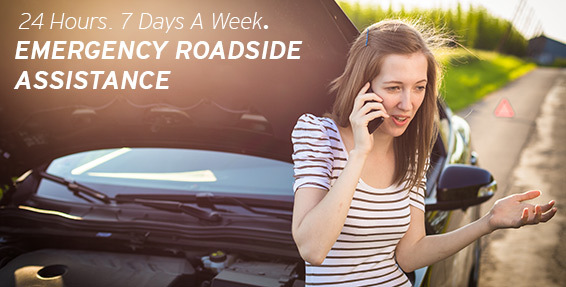 If we are unable to get to the customer within 90 minutes, we will credit back the daily charge for the Premium Emergency Roadside Service. **Lost Key Service and Spare Tire Mounting are provided through the terms and conditions of some corporate contracts. Consult your Company Travel/Personnel Departments for details. Restrictions apply. ***Travel delay costs resulting from non-drivable accidents only and when we cannot deliver a vehicle within three (3) hours. Requirements for corporate account customers may vary. Premium Emergency Roadside Service is available at all participating Hertz locations in the United States and Canada.